Around 800 B.C. the people of Greece started building settlements once again. The settlements began as small farming villages, but some grew to become cities. Often, a city joined with small towns, villages, and nearby farms to form a kind of large community called a polis, or city-state. Sparta, Athens, Argos, and Aegina were all ancient Greek city-states. To protect themselves from invaders, most Greek communities built a fort on top of a large hill. Farmers from the countryside moved to this protected area for safety during enemy attacks. Later this secure place, called an acropolis (uh»KRAH»puh»luhs), also became a center of religion in many city-states. 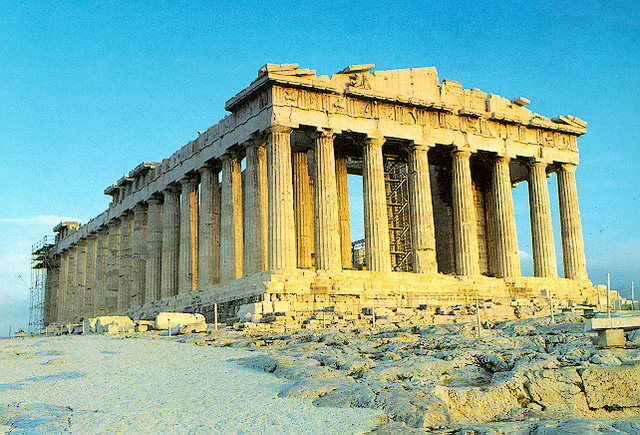 Outside the acropolis stood houses, temples, and an open-air market and gathering place called an agora (A»guh«ruh). People met in the agora to trade and to discuss the news of the day. At first a king or tyrant ruled each city-state. In ancient Greece a tyrant was someone who took control of a government by force or other means and ruled alone. Today the word tyrant refers to a cruel ruler. Over time each city-state formed its own way of governing. In some city-states the richest men shared authority with a king. This wealthy ruling class, or aristocracy, was made up of powerful landowners and merchants. In other city-states all free men took part in government. These men met in an assembly, or lawmaking group, to make decisions. Most city-states had fewer than 5,000 people. As the population of a city-state grew, overcrowding forced some people to look for new places to live. Many city-states set up colonies in Asia Minor, northern Africa, and southern Europe. 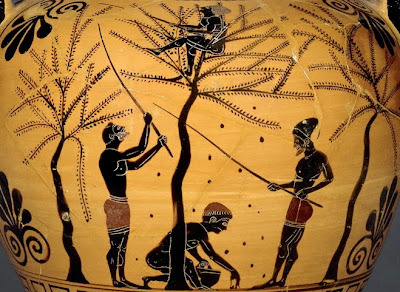 Besides providing space for more people, the colonies brought the Greeks new natural resources and trade markets. This also helped spread Greek ideas and customs through the Mediterranean region. Soon the city-states began to compete for land and trade. Sparta and Argos both wanted control of the Peloponnesus. Athens and Thebes were rivals for control of the land northeast of the Peloponnesus. Sparta and Athens, while not rivals at first, had very different ways of life.